Poor Joe, it had a lot going for it. Based on a fairly well-regarded novel of the same name by Larry Brown, it was to be a return to form for David Gordon Green – the former indie darling who had a nice (albeit unspectacular) streak going with George Washington, All the Real Girls and Undertow before selling out with mainstream stoner comedies. Green recaptures some of that old magic in certain scenes (the film’s opening is especially effective, as are many of the Cage – Sheridan interactions) while populating the film with Malickian cinematography of some nameless (and tirelessly decrepit) Southern town and non-actors in supporting roles riffing in aimless scenes that lead nowhere. There’s a fitting music score but also some poorly written and confusing voice-overs. There’s chilling layered irony (the man who played Sheridan’s revolting father, Gary Poulter, was a homeless man who died shortly after filming from drowning in shallow waters while drunk) juxtaposed with senseless wallowing in the muck (did we really need to see that Lee Daniels-esque and dimwitted scene in the brothel that ended with a dog eating another dog?) For all the naturalism Green tries to create, everything ends up feeling oddly forced and off-putting, even the “killing and planting trees as a metaphor for life” bit. The characters remain undercooked in their overripe setting, and many of the interactions and subplots make little sense and only seem to exist to set-up the violence of the final act. Joe also suffers from an unfortunate case of “much of the same.” It can’t help but face comparisons to Jeff Nichol’s ironically more novelistic and memorable Mud which also starred Sheridan as another down-on-his-luck kid who latches on to a strange but compelling loner. Cage’s attempt at a comeback is eerily similar to the recent McConnaissance as Joe echoes both the sentimentality of Mud and the shocking brutality of Killer Joe – two superior works that knew their wheelhouses and struck the right tone – Mud appearing like a modern-day Mark Twain tale and Killer Joe being the darkest and meanest of comedies. Joe wanted to be something nice, something emotionally resonant…a hopeful coming of age for Sheridan’s character in the wake of bleak redemption for both Cage’s character and Cage the Actor, but it can’t help but be gruesome, mean and shallow, even in all that pretty sunlight drenched scenery. It’s an interesting effort, but ultimately offers nothing new and leaves little to be admired despite the best efforts of its two leads and a director still trying to find his way back home. 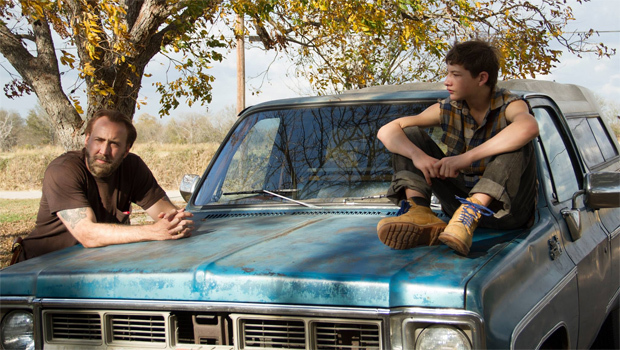 This entry was posted in Art-house Cinema, Book to Film Adaptations, Movie Reviews, Movies and tagged Coming-of-age, David Gordon Green, Gary Poulter, Joe, Larry Brown, Nicolas Cage, Southern Gothic, Tye Sheridan. Wasn’t the kid in Mud? If so, thought he was great in that film. Yes, Sheridan was in Mud. He’s pretty good in this too, but he already seems typecast. Hmmm…. I liked the trailer and was (still am) hoping this one to be a good drama with all human elements intact. So I’ll reserve my opinion for later. Maybe we need to see Joe as a standalone drama in itself rather than comparing it to Mud. The comparisons are probably making this seem a bit pseudo. Dunno, just thinkin’ out loud here. Prakash – all comparisons to other films aside, it’s a problematic film in its own right with messy pacing, shallow characterizations and poor taste. I’ve watched both Mud and Joe! And I enjoyed them both! This was well acted and Cage proved he could still dish out great performances. The coming of age tale of Ty’s character was intriguing! Anyways, who cares about it being gruesome? Oh, I didn’t mind the gruesomeness…it was the pointlessness and poor writing and characterizations that I minded. The gruesomeness also had a condescending tone to it…like, “look at how poor and hard-scrabbled and dog-eat-dog these miserable people are!” It’s a fine line that was crossed…something like Winter’s Bone had some similar elements but came across as far more authentic…to me at least. And heck, I liked Killer Joe – and THAT WAS GRUESOME as all get-out – but the tone was of a dark comedy so it worked. Thanks for explaining! I get you now! It bothers me when folks bash a film just because it has a little blood in it. I’ve seen some give the Raid 2 a low score because it was too violent for their liking….seriously? I totally get your point though! The film had a ton of random and questionable acts that did not lead anymore. I enjoyed it a lot more than you did but I cannot deny the facts! hahahaha!! love that opening sentence assessing the contradictory nature of Nicolas Cage’s acting output. I haven’t yet seen this film, but your summary judgement is not at all surprising. I will compare notes again at some point. But I am certainly a very big fan of MUD!